I have also been trying to get the bound buttonholes into the Celtic Braid Coat. Â I spent this afternoon tearing my hair out, sewing and ripping and re-sewing, and have two bound buttonholes that, if you squint, might pass muster. Â However, they don’t match each other – one is long and skinny and the other is short and fat. Â This after four hours of work! Â I am thinking I may go with Janet’s suggestion from a few blog posts ago, and try a few samples of reverse bound buttonholes. Â It couldn’t possibly be any worse than my current work. So anyway, after realizing that the second bound buttonhole wasn’t even, even after four hours of fiddling, I did the only possible thing: get up and go shopping! 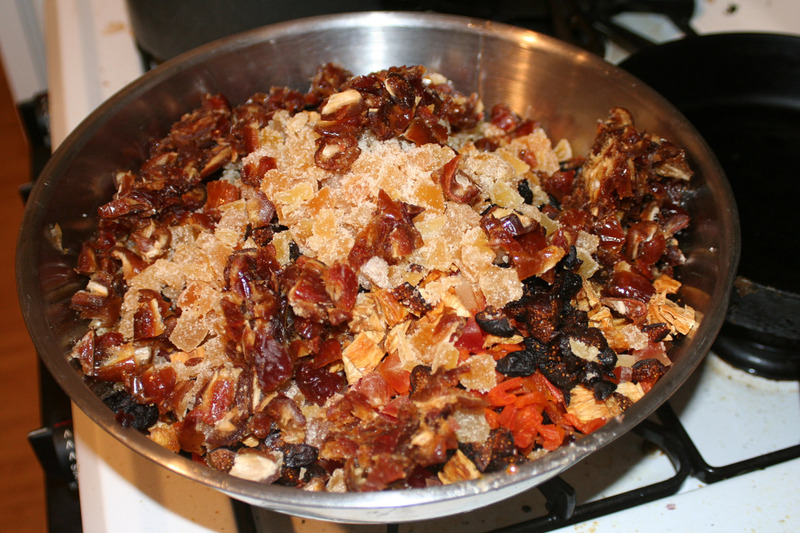 Â I had been planning to make fruitcake next weekend, but given my utter incompetence at everything else, thought it might be good to do at least one thing all weekend that would be fun and easy. So far I’ve only cut things up, and of course nibbled on the bits and pieces – sugar therapy! Â Tomorrow I will mix up the batter and bake it – it’s too late to bake it tonight, since the cakes take about two and a half Â hours to bake. Â But I’m really looking forward to the wonderful smells that tomorrow will bring! Tomorrow is also a dye day – some friends are coming over to play with tie-dye! Â I’ve dyed most of my essential items, but have lots of T-shirts (not to mention that bathrobe!) to play with. Â I think it’ll be loads of fun! Â Can’t wait to get back into the dyepots. Â I’m tempted to make some katazome paste, too. I always enjoy your blog and have learned so much from you. Can identify with your “unable to get things right lately” feeling but at a much lower skill level. Thanks for sharing.